Still think wrestling in the WWE and its contemporaries is fake? Watching wrestling with my dad is probably one of my earliest memories with him, and one of the happiest. He was always so active when he watched wrestling. If there was a particularly brutal move, he'd be out of his seat, moving his arms this way and that as though he was trying to help whatever wrestler that was currently in the bout win. I was fascinated by what he was doing, and I remember being fascinated by the electricity being generated on screen. I am relatively familiar with the wrestlers we have now, but names like Demolition, the Bushwhackers, Hulk Hogan and Andre the Giant were as familiar to me as those of my family members. 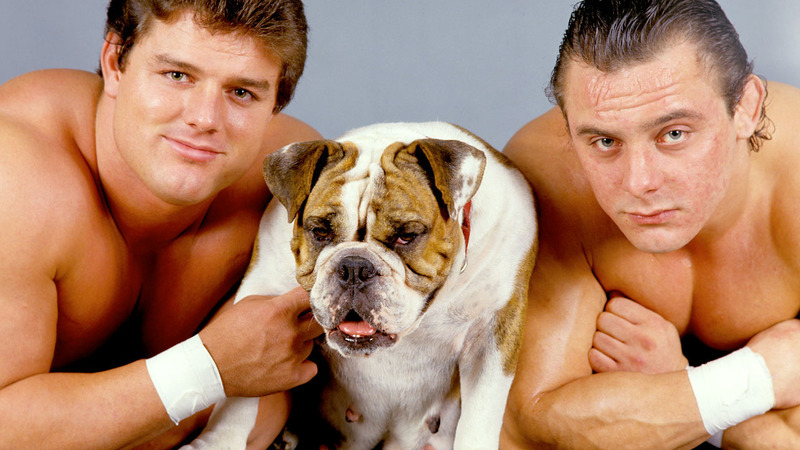 The British Bulldogs were probably one of my favorite tag teams to watch back in the day of the World Wrestling Federation. I loved how closely Davey Boy Smith and Dynamite Kid worked together, and how seamlessly. In retrospect, I should not have been shocked by how truly awesome the British Bulldogs were in the squared circle. They were trained by the legendary Stu Hart, and Davey Boy Smith was married to Diana, Hart's second youngest daughter, so the Hart influence in many ways ran deep. Watching Davey Boy and Dynamite Kid take on all corners in the ring over their years with the WWF—now the WWE—pretty much took my breath away. I couldn't believe anyone that big could move as quickly as those boys did, and I found myself wondering at the time if it was "real," as so many of my contemporaries did. The 1980s world of wrestling has been gone for a long time, and it would seem that all of the greats that I'd grown up with are dying at impossibly young ages. Dynamite Kid, aka Tommy Billington, died December 5, 2018—his 60th birthday. His tag team partner and cousin, Davey Boy Smith, died in 2002 at 39. The Ultimate Warrior moved to that great beyond in April 2014 at 54, Rowdy Roddy Piper passed in 2015 at 61 and Randy "Macho Man" Savage died in 2011 at 58. In almost all cases, all these amazing athletes died with some help from steroid use and as a result of the trauma to their bodies over years of wrestling and doing incredibly acrobatic takedown moves. Even the surviving wrestlers of today acknowledge that they, too, are struggling with a wide range of health issues probably brought about by the strenuous and dangerous moves they do inside the wrestling ring. Are the stories that play out on shows like Raw and Total Divas scripted? No question; while it's pretty certain that not everyone gets along on shows of this nature, odds are pretty good that the atmosphere behind the scenes at these shows is not as virulent as one might think, given the flying axe kicks and dropped elbows throughout shows of this nature. However, as scripted as the shows are, there is no way that a script can accurately reveal how hard an elbow lands on human flesh—or even if it's landed completely in the right spot. When these wrestlers do a body slam, viewers have to recall that it's called a body slam for a reason, and there will no doubt be trauma to a body in its aftermath. After a while, that does take its toll. According to Fox Sports, wrestlers like Jason Jordan are finding they might permanently be out of commission due to injuries to their neck and shoulders. Goldust is "adjusting to a life outside the WWE" after injuring both knees. The Undertaker—who many argue is one of the greatest wrestlers the WWE has ever seen—admits to significant injuries as a result of his time in the squared circle. "Both eye sockets have been crushed...they were separate, years apart. I've had probably..." he acknowledged. "I'm guessing, I'm closing in on 20 different orthopedic type surgeries from just wrestling-related injuries. Both hips have had a form of replacement, torn biceps, torn pecs, torn triceps." With a seemingly increasing number of wrestlers that are either being taken out of their careers into retirement because of injuries or dying due to complications from them, perhaps we need to ask whether the world of the WWE—at least as far as the physical toll on the wrestlers themselves goes—is a little too real.